Riding a motorcycle on Miami Beach can be both exhilarating and scary. You ride up Alton Road and down Ocean Drive. Then over the causeways. The scenery can be magical at times. There are those times when you are in a zone. A perfect moment. Then in a second it all changes. Somebody drifts into your lane or turns in front of you. You have to take evasive action. Hopefully you don’t hit anything or anyone. You pray that you don’t go down. In mere seconds you went from a moment of Zen to wondering if you are going to live. The Miami Beach motorcycle accident lawyers at the Wolfson Law Firm understand motorcycle riders and passengers. Our personal injury lawyers have over 60 years of experience in representing people injured in motorcycle crashes and the families of those killed in motorcycle accidents. Our Miami Beach wrongful death attorneys and personal injury lawyers can help you. Just call (305) 285-1115 for your free consultation and we will get started on your case. Our Managing Attorney Jonah Wolfson is a resident of Miami Beach where he lives with his wife and children. In addition, he served his community for eight consecutive years as a Miami Beach City Commissioner until he left office because of term limits. Jonah is a bilingual wrongful death lawyer and personal injury lawyer in Miami. As a Commissioner and in serving his personal injury clients, Jonah has always made himself available to his constituents and clients in English and Spanish. At the Wolfson Law Firm we place a high value on excellent communication. Our personal injury legal team is also bilingual and we are all ready to help you after your Miami Beach motorcycle accident. Just call us at (305)285-1115. On top of everything you will face after a Miami Beach motorcycle accident, you will have to face the inherent bias and prejudice of the general public towards people on motorcycles. It is these preconceived notions that the insurance companies and insurance defense lawyers seek to exploit to drive the value of your claim. That is why it is important for you to make certain that you find an experienced motorcycle accident attorney for your Miami Beach motorcycle injury case. The Miami Beach motorcycle personal injury lawyers at the Wolfson Law Firm invite you to review our qualifications, experience and recent cases. Ask us about the motorcycle injury cases we have handled and the results we obtained. We would be honored to have the opportunity to interview with you. We will answer all of your questions and our consultation is free. If you decide to hire us, then you will not owe a fee unless we make a recovery for you. 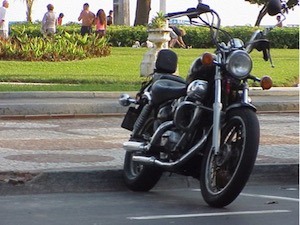 If you were injured in a Miami Beach motorcycle accident while visiting, our Miami Beach injury lawyers can help you. Over the years we have represented folks from all over South America, Europe, Asia and North America.